1. If you really want to excel at writing, study grammar. Grammar is like auto mechanics. You don’t have to know much about the a car engine to make adequate use of the vehicle. 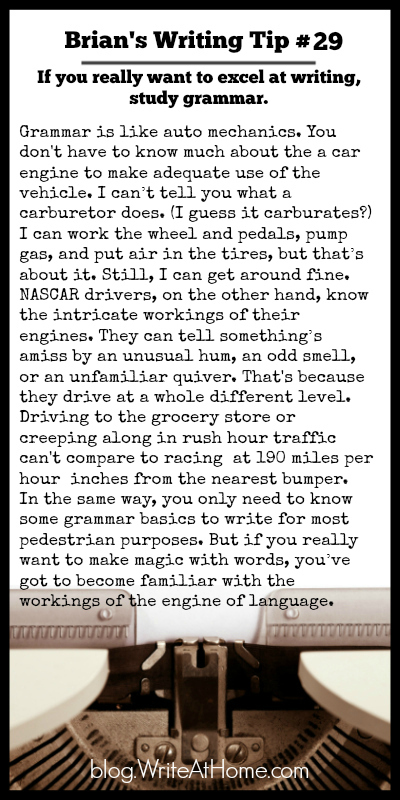 I can’t tell you what a carburetor does. (I guess it carburates?) I can work the wheel and pedals, pump gas, and put air in the tires, but that’s about it. Still, I can get around fine. NASCAR drivers, on the other hand, know the intricate workings of their engines. They can tell something’s amiss by an unusual hum, an odd smell, or an unfamiliar quiver. That’s because they drive at a whole different level. Driving to the grocery store or creeping along in rush hour traffic can’t compare to racing at 190 miles per hour inches from the nearest bumper. In the same way, you only need to know some grammar basics to write for most pedestrian purposes. But if you really want to make magic with words, you’ve got to become familiar with the workings of the engine of language. Please leave your thoughts and questions below. Let’s do this together.